April 22, 2017 at 7:30 p.m.
National Anthem, a capella, at all the home football & basketball games at area high schools & colleges. He was awarded two full-time Presidential Scholarships to Shenandoah College & Conservatory of Music in VA and Central State University in Wilberforce, OH. Mr. Armstrong earned a Master’s Degree in Public Administration from the University of Akron. As a soloist he has traveled extensively in the U.S. as a member of the widely acclaimed Central State University Singers, recording with the Cincinnati Pops Orchestra, Amen: A Gospel Celebration with Jennifer Holiday, Maureen McGovern, Lou Rawls, and Gershwin: Selections from Porgy and Bess featuring Cab Calloway. Both records were nominated for Grammy awards. 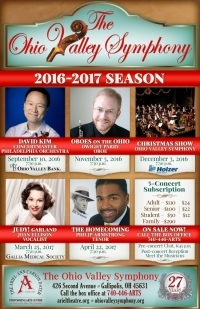 Join The Ohio Valley Symphony for the 27th Season featuring 5 exciting concerts in our home, Ariel-Dater Hall. 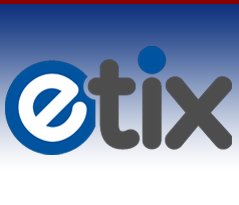 Order subscriptions online or call the box office today at 740-446-ARTS! 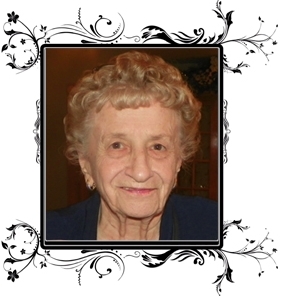 September 10, 2016 at 7:30 p.m. 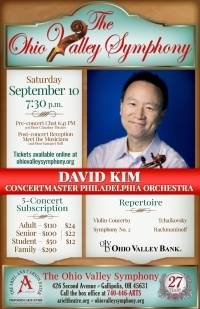 Highlights of Mr. Kim’s 2015-16 season includes teaching/performance residencies at Oberlin College, Bob Jones University, and The Boston Conservatory of Music, continued appearances as concertmaster of the All-Star Orchestra on PBS stations across the USA and online at the Kahn Academy; recitals, speaking engagements, and appearances with orchestras across the United States; multiple solo performances with the The Philadelphia Orchestra including the Brahms Double Concerto, the Beethoven Triple Concerto, and a New Year’s Eve performance of the Meditation from Thais with Music Director Yannick Nézet-Séguin conducting; and the launching of the first annual David Kim Orchestral Institute of Cairn University in Philadelphia where he is also a Professor of Violin Studies. 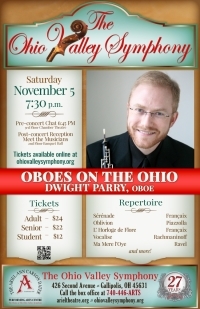 November 5, 2016 at 7:30 p.m.
Dwight Parry is just rounding out his first decade as the principal oboist of the Cincinnati Symphony Orchestra. 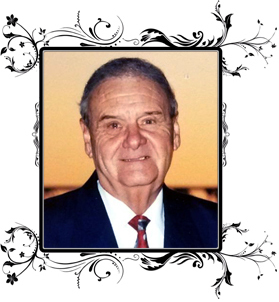 Previously, he held the same position with the San Diego Symphony and was a fellow with the New World Symphony. He has performed as guest principal oboist with groups including the New York Philharmonic, the Chicago Symphony, the San Francisco Symphony, the Atlanta Symphony, the Los Angeles Opera, and the Deutsche Symphonie of Berlin. Originally from coastal Southern California, he found his passion for music studying piano, voice, and jazz saxophone. It was not until late in high school, however, that he began playing the oboe and truly found his calling. He studied at the Cleveland Institute of Music with John Mack and at the University of Southern California with Allan Vogel and David Weiss, a gentleman who also taught him to surf. December 3, 2016 at 7:30 p.m. 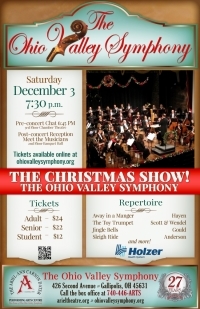 The Ohio Valley Symphony presents its most beloved holiday tradition, The Christmas Show! Order tickets early! As part of the Ohio Valley Symphony’s mission to bring live, professional, orchestral music to the region and to instill a love of music — especially in children, the public is encouraged to attend OVS rehearsals for free at 7–10 p.m. Friday, Dec. 4, and 1–4 p.m. Dec. 5 at the Ariel. Open rehearsals are a great way to grow familiar with symphonic music, and they offer a unique behind-the-scenes glimpse at the preparation of an orchestral performance. 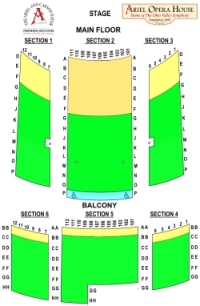 Single tickets to the Ohio Valley Symphony’s THE CHRISTMAS SHOW! cost $24, $22 (senior) and $12 (student). 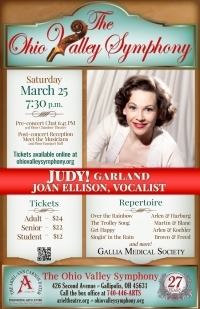 Tickets and more information are available at the Ariel-Ann Carson Dater Performing Arts Centre box office, 428 Second Ave., Gallipolis; by phone, (740) 446-2787 (ARTS); and through the Ariel website www.arieltheatre.org. 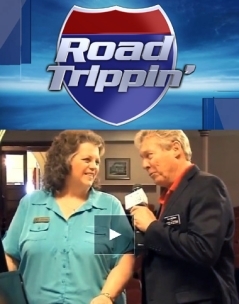 Joan Ellison has been praised for her “vocal prowess…. [and] organic grasp of the classic songs” by Michael Feinstein, and “possess[ing] a crystalline voice that never stops” (Donald Rosenberg, The Plain Dealer). 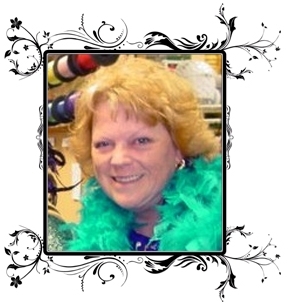 She has been performing Garland tunes with symphony orchestras and in theaters for several years, but the 2016 TheatreZone (Naples, Florida) production of The Boy From Oz marked the first time she had ever actually played Judy.